"The Ring was made in the fires of Mount Doom. Only there can it be unmade." Anticipation for the first installment of Peter Jackson's epic adaptation of J.R.R. Tolkien's classic fantasy novel was matched only by the anticipation for the DVD releases of the film in its theatrical and extended versions. This limited edition disc provides both of them on a single Hobbit-sized disc, through the magic of seamless branching, stuffing full a DVD-18. Hobbits, for those living in a hole for 65 years, are a mythical race of men standing about 3'6" with large hairy feet. Although often stay-at-home types, a few of them get caught up into unaccountable adventures. Hobbit Frodo Baggins (Elijah Wood) comes into possession of the One Ring, a magic ring created by the Dark Lord Sauron and containing much of his power. As Sauron begins to reconsolidate his power to exterminate humans, elves and everyone else, Frodo learns from the wizard Gandalf that the Ring must be taken to Mount Doom, deep in Sauron's territory, and cast into its fires to destroy it. But its power is so great a temptation that neither Gandalf nor anyone powerful can safely carry it. Meanwhile, Frodo is being pursued by the Ringwraiths, black-clad, undead servants of Sauron who will stop at nothing to retrieve the Ring. Frodo and his hobbit friends Sam (Sean Astin), Merry (Dominic Monaghan) and Pippin (Billy Boyd), along with elf Legolas (Orlando Bloom), dwarf Gimli (John Rhys-Davies) and men Aragorn (Viggo Mortensen) and Boromir (Sean Bean) work with Gandalf to try help Frodo make his dangerous journey in this first third of the story. I'll make no bones about it; I've loved this movie since I saw it in the theaters and I still love it on disc. Perhaps even more so. The epic scope of the novel is captured in a way that no one ever seems to have imagined possible, largely through being able to shoot in Jackson's relatively unspoiled New Zealand, a fantasy world of its own. The casting is also impeccable, with Elijah Wood heading up a cast in marvelous manner. His transition of Frodo from carefree hobbit lad to tormented Ringbearer is utterly perfect. On repeated viewings, I've adopted a real fondness for Sean Bean as Boromir, who gives a many-layered performances as Boromir, who means well but ill disguises his own lusts for the Ring. The interaction of Ian Holm, as Frodo's uncle Bilbo, with Gandalf and Frodo also is highly memorable. The special effects generally come across quite well on the smaller screen. The one exception is a computer-generated sequence of Legolas on the back of a cave troll in the Mines of Moria, which looks terribly fake. But the mix of normal size people playing hobbits and dwarves, alongside human-sized characters, is almost entirely seamless. On occasion, a perceptive viewer might say, "oh, that's using forced perspective," but in general the union of these characters is absolutely seamless. The score, while somewhat derivative at times, more than grows on the viewer and supports the picture quite well indeed. The camera tends to be a bit too active, swooping and flashing past in a manner that draws attention to itself. But on the whole, the film is a visual feast full of absolutely wonderful imagery. There are any number of downright thrilling visuals, such as the sight of a backlit Ringwraith waiting impatiently for Frodo, or the Ringwraiths smashing the gates of the village of Bree, or shots of the old fortress at Weathertop in partial sunset, or the 'wraithvision' that provides a perspective as to how Frodo sees the world when he puts on the Ring. Jackson also masterfully uses transitions from scene to scene, compressing the narrative in a manner that keeps connections clear but also manages not to disappoint the Tolkien fanatics. He uses this to good effect as well in providing slightly deceptive connections that heighten the suspense and in many ways make the story stronger than what Tolkien wrote�and to actually improve upon one of the great books of the 20th century is by itself no mean feat. Image Transfer Review: The anamorphic widescreen picture appears to be the same as found on the prior releases. That said, it is quite beautiful, with plenty of detail and textures visible. Color is excellent as well, and the source print is quite flawless, with no damage visible whatsoever. The one significant quibble I have is that the transfer in the Moria segments seems a bit too dark. It's lacking much of the detail that I recall from the theater, and in fact more is visible in the same sequences contained in the trailers. Excessive vertical filtering seems to be the culprit. Some minor edge enhancement ringing is readily visible on horizontal surfaces, most notably the horizon and the brim of Gandalf's hat, but it's not terrible. More distracting is compression artifacting on the subtitles during Elven speech; this renders them rather difficult to read. The seamless branching function works, as the name implies, seamlessly, and there were no moments of halting (other than the layer changes). I am really looking forward to the HD-DVD release of these films. Audio Transfer Review: The films sport 5.1 EX and 2.0 English tracks only. The EX track is incredibly vibrant, with huge amounts of low bass (such as when the Ring drops to the floor, or Sauron is defeated in the prologue). The audio is very clean and dialogue clear at all times. There's plenty of surround activity at all times, giving a first-rate immersive effect to the DVD. The music is appropriately bombastic or subtle as the occasion calls for. Extras Review: The prime attraction for this new limited edition is the second disc, which bears a 1h:24m: behind-the-scenes documentary directed by Jackson collaborator Costa Botes. This features a great deal of never-before-seen material, including a short scene that appears in neither version of the film (featuring Gandalf and Frodo discussing the Elvish tongue of Sindarin). At first blush it seems rather disorganized, but the footage roughly follows the content of the film, in the order that the events depicted occur, rather than a chronological record of the filming as we were served in the King Kong Production Diaries. Irritatingly, the material is presented in nonanamorphic widescreen. The content does give an excellent presentation of the chaos and the difficulty that Jackson faced in this vast undertaking. Although there is DVD/ROM material advertised, it consists of generic weblinks to New Line and related companies. Is it worth yet another purchase? The many devotees of the film may think so. Personally, I would have preferred a 2-disc set of just these documentaries as a stand-alone release for a much lower price. The first installment of Peter Jackson's epic comes to DVD a third time, combining the theatrical and extended editions with a new full-length documentary. 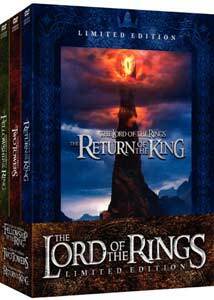 Tolkien obsessives will be interested, but is there anyone who doesn't already have at least one copy of these films?